Sometimes clients who are involved in their first business transaction are surprised and even frustrated that the lawyers on both sides of the deal devote so much time and attention to “Representations and Warranties” when they negotiate a definitive purchase and sale agreement (the “PSA”). This part of the PSA might initially seem like wasted words that make the document thicker and the legal bill higher, but they are important. Buying an operating business is not as simple as buying a single piece of tangible property, like a computer or a truck. In most cases, a significant part of the business value is in assets that can’t be physically inspected before the sale. These assets such as trade names, customer lists, supplier relationships, and other intangible assets often must be purchased largely on trust, with some verification in due diligence. The difference between “Representations” and “Warranties” isn’t important for this article, so we will use them interchangeably. What’s more important is understanding why carefully negotiated reps and warranties are critical to Buyers who want to ensure that they are getting what they bargained for and to Sellers who must make sure they don’t make promises they can’t keep. Most small and midsize transactions are structured as asset sales, where the Buyer forms a new holding company and acquires substantially all the assets of the Selling company but does not assume its liabilities. Sometimes, when the Selling company holds licenses and other non-transferable rights, the Buyer acquires the stock of the Selling corporation (or the membership interest, if it’s an LLC), which includes the company’s liabilities as well as its assets. 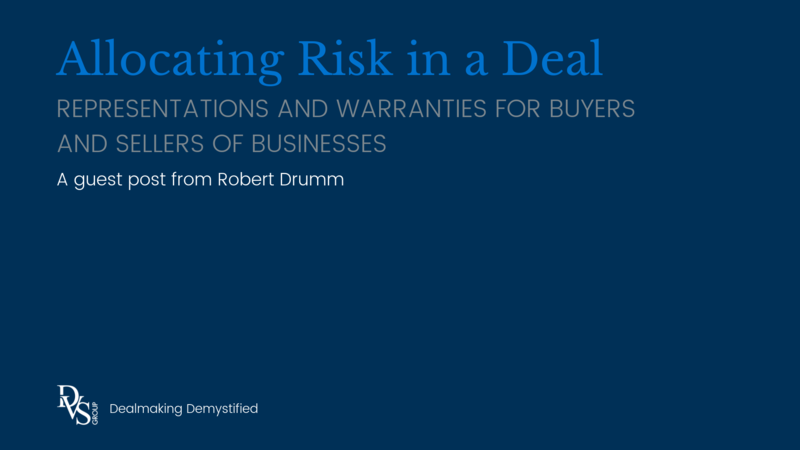 Although the deal structure may be different, most of the important representations and warranties are similar in both asset sales and stock sales. In this article, at the risk of oversimplification, we’ll talk about what Buyers and Sellers want in the main categories of reps and warranties. To spare you the tedium, we won’t get into the precise, legal language. Although getting that part right can make the difference between the ultimate success and failure of a business transition for both parties. Both Buyers and Sellers will include representations and warranties that affirm that the people they are negotiating with and the people signing the PSA actually have the authority to do a deal. They will also want to be certain that the company they’re dealing with actually exists and is in good standing, and that the deal they’ve agreed to doesn’t breach any other obligations the other side may have. While we would reasonably assume all this in most cases, it would be a disaster if that assumption proved false. For instance, nobody wants to discover at the closing table that the person who claimed to represent the Buyer was not an executive officer of the Buyer but was instead a lower-level employee or even a rogue broker or consultant. Conversely, it would also be a disaster if the Buyer discovered after closing that the Seller was prohibited from transferring certain technology or contract rights because of their agreements with suppliers or previous owners. 2. Title to and Condition of Assets. Buyers want to be certain that the assets of the business actually belong to the Seller, and that they aren’t merely borrowed or leased. They also want to be sure that there aren’t any liens against those assets, and that the assets are in good working order and won’t require immediate replacement. 3. Legal and Insurance Compliance. Buyers want to be assured that the business has been operated in compliance with the law, and that it isn’t in jeopardy of losing its current insurance coverage or facing higher premiums. In an asset sale, a regulatory fine or even criminal charge against a Seller for previous business practices may not directly fall on a Buyer. However, the Buyer’s ability to use some assets may be affected by the action, and the cost of bringing the business into compliance with the law or insurance requirements might affect future profitability. Additionally, potential bad public relations associated with regulatory and even criminal problems would also affect the Buyer’s growth prospects. Sellers will typically negotiate to limit these representations to their knowledge, or change the language to “substantially in compliance” because they rightly observe that our society is so highly regulated that it is impossible to know about, much less comply with, “all” laws. Buyers want to know that the financial information they’ve received from the Seller are accurate and prepared according to standard accounting practices. Buyers may have received profit and loss statements, balance sheets, receivable and payable schedules, debt schedules, inventory reports and budgets, or financial projections and models.. Sellers are usually willing to warrant that the historical financial information is indeed accurate in “all material respects” but leave room for de minimus errors and judgment calls which are inevitable in any complex business. Sellers will often refuse to warrant any projections, any valuations of equipment or intangible assets, or any other financial information that is dependent on future events or subject to differences of opinion. Buyers want assurance that the Sellers’ customer lists are accurate, and that there’s been no change to any significant customer relationships that will adversely affect the customers’ future purchasing patterns. Likewise, Buyers want assurance that major suppliers will continue to provide goods and services to the business, and that supplier performance is acceptable. The parties will negotiate what constitutes a “significant” customer or “major” supplier, and Sellers will usually negotiate to limit representations to their actual knowledge. While a Seller may have a good, longstanding relationship with a customer, the Seller can’t always know if that customer is about to be bought out by someone with a different supply chain, or that a competitor is about to wrestle some business away. The Seller hesitates to make warranties about those unknown events. Because most businesses lose and gain customers and change suppliers from year-to-year, there will usually be exceptions to these general representations which will be disclosed on a schedule. Buyers will seek several representations from Sellers regarding employment matters, including a schedule of compensation, benefits, bonus and commission accruals, vacation and sick day accumulation, and withholding tax status. Buyers will also seek a representation that all Employee compensation is paid as of the closing date, that the Seller is in compliance with employment and ERISA laws, that benefit plans are paid up, and that there are no labor disputes or employment claims. Regardless of the form of transaction, these reps and warranties are important. In a stock sale, the Buyer will always assume all employment liabilities. In an asset sale, the Seller may initially say no representations are necessary regarding employment liabilities because the Buyer starts fresh with new employees (the employees usually are fired by the Selling Company at closing and are immediately rehired by the Buyer). However, Buyers usually want to start their new staff on a positive note, and as such, they often carry over vacation accruals and offer comparable compensation and benefits. Buyers are also aware that even in an asset sale, some employment obligations and tax claims may follow the assets, so it’s important to confirm there are no issues, or to disclose any exceptions. Buyers typically want disclosures of all material contracts with customers, suppliers, and other service providers. They also want the Seller to affirm that the contracts are in effect and neither party is in breach. This list of contracts is typically long and includes everything from master service agreements and key customer and supplier agreements down to small matters like doormat service, alarm monitoring, and software licensing. In our experience, this representation is rarely controversial, but some Sellers often negotiate a minimum value below which contracts don’t need to be disclosed, simply because of the time it takes for Sellers to identify and list every contract, no matter how small. 8. Liability Claims and Litigation. Even if the Buyer generally doesn’t take responsibility for liabilities in an asset sale, there is a risk of business disruption, judgment liens attaching to assets, insurance premium increases and public relations difficulties when a Seller is facing an actual or threatened lawsuit. These claims include employment claims (also included in the reps and warranties above), product liability and personal injury claims, collections matters, and all manner of commercial disputes. Therefore, in both asset and stock sales, the Buyer wants Seller to represent and warrant that there are no such claims, and the Seller—who knows that sometimes claims arise long after the problematic even occurs—is often willing to represent that “to its actual knowledge” there are no claims. Of course, if there are known claims, those should be disclosed in the schedules. Environmental matters are serious considerations for some Buyers, especially for manufacturing and food processing businesses. They’re hardly considered by Buyers of marketing firms or other “office type” businesses, but they should be. Environmental liabilities typically run with real property and potentially expose even innocent owners and innocent tenants to historical claims—claims based on activities that may have occurred decades before the current Sellers came on the scene. And these claims can arise even if the business in question is an office-type business. Therefore, a PSA typically contains representations and warranties that the Sellers have never had any environmental incidents, used any hazardous materials, or know of any previous environmental issues on the property, and any exceptions are typically disclosed on a separate schedule. Both Buyers and Sellers will name their advisors, brokers, and others who are entitled to a fee if the transaction closes, and they will represent to each other that there are no other finders or brokers who would be entitled to a fee on closing. We saved the most controversial representations and warranties for last. Buyers will often seek broad representations and warranties from the Seller stating that there have been no material changes in the condition of the business, the industry, or the economy that would cause a material adverse change (commonly called a “MAC” in deal jargon) in the business. Sellers may initially refuse to give these representations entirely, because they are broad, all-encompassing and carry too much risk with them. Depending on a Seller’s relative negotiation strength, they may not budge from that categorical refusal, or they may move to a compromise position. In that case, they will make some narrower representations about matters within their knowledge but refuse to make broad representations about matters outside their immediate control. In the end, the process of negotiating reps and warranties is a process of assigning the risks of a business’s past, present and future. Some of these risks are large, in terms of probability or in terms of potential cost. Others are small. But each deal is different, and in every case Buyers and Sellers try to avoid or mitigate as much of that risk as possible and arrive at some compromise. Experienced advisors, attorneys, and clients with common sense can get through the necessary process of negotiations fairly quickly. A reasonable compromise on reps and warranties can sometimes be reached with a few back-and-forth exchanges over a couple of days on a simple transaction. Unfortunately, inexperienced advisors or stubborn clients can extend the process into many weeks. Although we have experienced some situations where negotiation of reps and warranties were extended and expensive, we have also seen the harm caused by a complete disregard for reps and warranties. Therefore, it’s important for the parties in a business transaction to understand and prioritize risks when they take up the PSA. This will help to focus adequately on getting the most important reps and warranties right, and also to avoid wasting time, money, and good will by over-negotiating those in which the probability of breach and the adverse consequences are low.